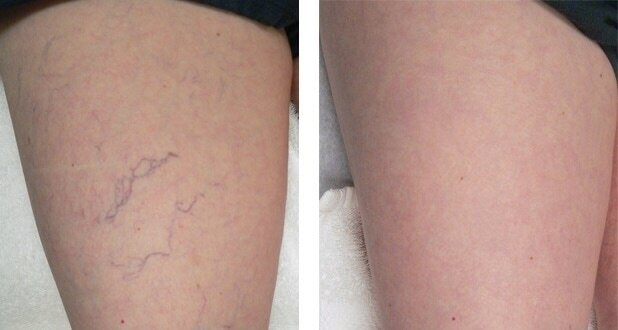 ​Spider Vein/Broken Capillary Laser Treatment is a series of laser or BBL treatments that improve the appearance of damaged skin with little or no down time. BBL is a fascinating and effective way to restore the skin’s youthful glow. The light penetrates the skin and is absorbed by the abnormally dilated vessels or pigmentation. Heat then impairs the targeted vessels or lesions and the body begins a natural healing process. Any area can be treated, legs, feet, nose, cheeks, ears, neck, etc. Consultation is required and multiple visits 4-8 weeks apart are necessary to achieve optimal results. Your certified M Spa laser technician will customize your treatment plan to fit your individual needs.